Anna Odobescu will represent Moldova at this year’s Eurovision Song Contest in Tel Aviv with her song “Stay”. It’s a classic Eurovision ballad showing off some clear vocals as Anna yearns for a departing lover. Anna was chosen to represent Moldova after winning O melodie pentru Europa, its national selection show. Her big belter of a ballad finished first with the local juries and second with the televote. As we count down to Israel, we’ve compiled 10 facts you need to know about Anna Odobescu. Are you ready? Let’s do this! Though we only know her as Anna Odobescu, she is officially known as Mrs. Anna Vdovichenko. Married to musical producer Alexander Vdovichenko, her private life is full of love. But she has told women’s site Perfecte that it’s not easy to combine her singing career with her life as a wife and mother. Anna has practised music from a young age. She told Perfecte that as a child she dreamt of standing on the big stage. If she had not had the “musical gift from God”, she would have loved to act. Music brings her peace, allowing her to find her inner silence. Anna is a beautiful woman with a great fashion sense. And she likes to show that on Instagram. One feature of her personal look is her perfectly drawn brows. Whether she is wearing full-face or a natural look, Anna makes sure her brows are always on fleek. Make-up- Liubov Ojog Hairstyle- Tanea Obada Dressed by – Morphine Photo- Margarita Cernei @morphine_fashion @margarita.chernei @liubovi.ojog @obadatanea @ekaterina_sergheevici ??????? ?? ???????? ??????? Anna graduated from the Faculty of Pop-Jazz Vocal at the Pridnestrovian College of Music in Tiraspol. She went on to do another course in pop-jazz vocal, but this time at the Academy of Music, Theatre and Fine Arts in Chisinau. In total, she has ten years of music education. Her vocal range is impressive on “Stay”, but that’s not surprising after all those years of vocal education. In the past, Anna also taught others. She worked as a vocal coach at the Chisinau School of Arts named after V. Polyakov. One of Anna’s biggest achievements to date is her participation in the Slavianski Bazaar contest for young performers in 2016. She came second in a field of over twenty participants from all over the world. 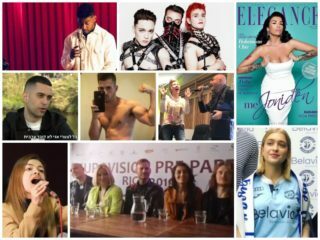 The Belarusian festival has brought us many successful Eurovision stars, including Donny Montell, Zejlko Joksimovic and Ruslana… so she’s in good company. Born in the city of Dubăsari in 1991, just on the East side of de Dniestr river, Anna is the third consecutive Moldovan Eurovision act to come from Transnistria. She follows DoReDoS and SunStroke Project, who hail from the Transnistrian cities of Rîbnița and Tiraspol respectively. She actually lost out to DoReDoS in 2018, finishing fifth in O melodie pentru Europa with “Agony”. For her Eurovision performance, Anna will collaborate with fellow Transnistrians SunStroke Project. For a moment, the Moldovan nuts went nuts and thought that the Epic Sax Guy would appear on the stage in Tel-Aviv, but they will only be involved in the creative process of staging “Stay”. Shortly before the Moldovan national final she lost her voice completely and was not even able to talk. She thought that she wouldn’t be able to sing and would have to withdraw. But on the morning of the final, she told herself “I will do it” and she subsequently won. “You always have to think positively, attune yourself only to the good”. We can’t wait for Anna Odobescu to bring us some classic Eurovision ballad realness in May. How do you think she will perform? Did these facts surprise you? Let us know in the comments below! Read more Eurovision 2019 artist facts here. obodexcuse me ? let the good sis dream, she deserves to qualify. She does, her song not so much. As much as I do remember Moldova is doing well when it comes to uptempo songs, not so much the slow ones. I didn’t really follow their selection this year, I listened to a few songs but got bored. Wasn’t there a better song, really? I wanted to give it a chance but I don’t know. Something rubs me the wrong way about this entry. Overall it was just a bad selection. Most of songs were either boring or weird (see Mr. Bognibov). There was some fuzz about “Ca Andriano Celentano” so you might want to check that one out as well. But to be fair, for a national final with 40 songs submitted, it could be worse. Similar to Lidia Isac, shes not the problem, its the song. I doubt that she as a singer and a good staging will help the weak song „Stay“ out of the semifinal. By the way that man that cohosted Slavianski Baazar 2016 (fact #6), Denis Dudinsky, was the same guy, that was interviewing all the artists at the opening ceremony of JESC 2018. Never underestimate Moldova – what if she’ll have an astronaut dancer on the stage in Tel-Aviv, huh? Both acts using an astronaut dancer didn’t qualify, so this is not a selling point.